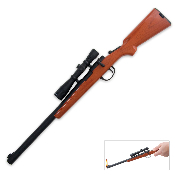 Be the first, if not the only one on your block, to have a Bolt Action Rifle & Scope that works as a BBQ lighter! This is a full-sized, fully functional lighter. It measures 15" long and is refillable using standard butane fluid. Use it at picnics, outdoor barbecues, lighting your fireplace, or that perfect cigar. It has an adjustable flame and is child resistant. This is truly a functional item for the guy who has everything.